Our battery connector cables with 1/4" or 6.3mm wide push-on terminals are made with premium 12 gauge UL1015 automotive grade primary wire and have clear vinyl jacketed locking 1/4" (6.3mm) wide push-on connectors which snap-lock onto the battery terminal and require pushing a tab on the connector to release it from the terminal. The terminals are crimped onto the wire and wire insulation and then soldered onto the wire for extra strength. Weather resistant ATO fuse holder with protective cap. Plastic cased high temperature ceramic base. Two 5" long 14 AWG red wires with 1/4" (6.3mm) wide push-on connectors. Rated for ATO fuses up to 40 Amps. Commonly used as a jumper wire in battery packs to provide fuse protection to the entire electrical system. 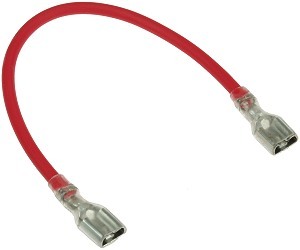 Six inch long battery pack jumper cable with 1/4" (6.3mm) wide push-on connectors. Made with 12 gauge stranded copper wire. High quality clear plastic covered locking type connectors require pushing a tab on the connector to release it from the battery terminal. Connectors are crimped onto the wire and then soldered for extra strength. Designed for interconnecting multiple batteries into a single battery pack. 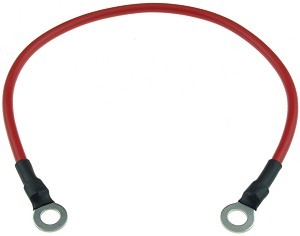 Nine inch long battery pack jumper cable with 1/4" (6.3mm) wide push-on connectors. Made with 12 gauge stranded copper wire. 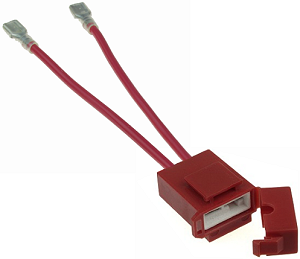 High quality clear plastic covered locking type connectors require pushing a tab on the connector to release it from the battery terminal. Connectors are crimped onto the wire and then soldered for extra strength. Designed for interconnecting multiple batteries into a single battery pack. 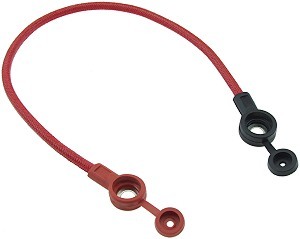 Twelve inch long battery pack jumper cable with 1/4" (6.3mm) wide push-on connectors. Made with 12 gauge stranded copper wire. High quality clear plastic covered locking type connectors require pushing a tab on the connector to release it from the battery terminal. Connectors are crimped onto the wire and then soldered for extra strength. Designed for interconnecting multiple batteries into a single battery pack. 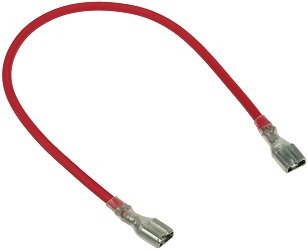 Fifteen inch long battery pack jumper cable with 1/4" (6.3mm) wide push-on connectors. Made with 12 gauge stranded copper wire. High quality clear plastic covered locking type connectors require pushing a tab on the connector to release it from the battery terminal. Connectors are crimped onto the wire and then soldered for extra strength. Designed for interconnecting multiple batteries into a single battery pack. Our fully insulated battery connector cables with 5.2mm ID ring terminals are made with premium high temperature silicone coated, fabric jacketed, vinyl insulated 12 gauge stranded copper wire. The ring connectors are covered by a plastic insulator with removable lid on all sides except for the bottom, making these connectors virtually short circuit proof. Twelve inch long battery pack jumper cable with top and side insulated 5.2mm ID ring terminal connectors. Tethered top insulator cap has a small hole in it for battery testing access. These premium battery cables are made with high temperature silicone coated, fabric jacketed, vinyl insulated 12 gauge stranded copper wire. Our battery connector cables with 5.2mm ID ring terminals are made with premium 12 gauge UL1015 automotive grade primary wire. The ring connectors are crimped and then soldered onto the wire for extra strength. Heat shrink tubing is then installed over the exposed part of the terminal and wire insulation jacket. Ten inch long battery pack jumper cable with 5.2mm ID ring terminal connectors. Made with 12 gauge stranded copper wire. Connectors are crimped onto the wire and then soldered for extra strength. Designed for interconnecting multiple batteries into a single battery pack. Twelve inch long battery pack jumper cable with 5.2mm ID ring terminal connectors. Made with 12 gauge stranded copper wire. Connectors are crimped onto the wire and then soldered for extra strength. Designed for interconnecting multiple batteries into a single battery pack. Fifteen inch long battery pack jumper cable with 5.2mm ID ring terminal connectors. Made with 12 gauge stranded copper wire. Connectors are crimped onto the wire and then soldered for extra strength. Designed for interconnecting multiple batteries into a single battery pack. Eighteen inch long battery pack jumper cable with 5.2mm ID ring terminal connectors. Made with 12 gauge stranded copper wire. Connectors are crimped onto the wire and then soldered for extra strength. Designed for interconnecting multiple batteries into a single battery pack. Twenty four inch long battery pack jumper cable with 5.2mm ID ring terminal connectors. Made with 12 gauge stranded copper wire. Connectors are crimped onto the wire and then soldered for extra strength. Designed for interconnecting multiple batteries into a single battery pack. Our battery connector cables with 1/4" ring terminals are made with premium 12 gauge UL1015 automotive grade primary wire. The ring connectors are crimped and then soldered onto the wire for extra strength. Heat shrink tubing is then installed over the exposed part of the terminal and wire insulation jacket. We only carry the highest quality battery connection jumper cables made with premium 12 gauge UL1015 automotive grade primary wire. Our battery cables have high quality locking type connectors which are crimped and then soldered onto the wire for the highest level of safety and reliability. All of our battery connectors have flexible plastic covers over the connectors to protect them from short circuiting.